It seems rare these days to find movies that have actual substance and entertainment value, but BP definitely delivered. I went in to the movie theater having only the expectation of enjoying another Marvel movie, only to have my heart explode because of the absolute beauty of every aspect of this movie. Sure, maybe it isn’t 100% perfect for some movie critics for whatever reason, but I loved it. To me, Black Panther was the Marvel movie we needed, for so many reasons. Now, maybe my opinion about this movie isn’t as important to you as someone else’s opinion. That’s totally okay! I just wanted to share my thoughts and feelings and add to the many voices praising it. Below, you’ll find short paragraphs dedicated to my favorite parts and characters of the movie. I could write individual posts for each of these sections, but I don’t have the necessary time, nor the knowledge required to do Black Panther the justice it deserves. Without further ado, here are some of my thoughts and feelings about 2018’s best movie. Oh, goodness, the MUSIC!!!! It was moving and really added to the atmosphere and the tone of the movie. I believe a movie’s score/soundtrack is just as important in the storytelling as the story-line is. The different genres mixed into the movie to indicate the moods and the personality of the characters gave me chills. The subtle changes between locations were fantastic and really brought everything together, without overpowering. I couldn’t ask for more from the composers or the track selections. EEEE!! Okay, so I’m a HUGE design nerd (okay, a huge nerd in general) and I LOVE LOVE LOVE LOVE LOVED the visuals!! Beautiful doesn’t even begin to describe the animation and the special effects. It was seamless. Sometimes CGI can ruin parts of movies (hello, Star Wars remastered! ), but the artists who worked on Black Panther knocked it out of the park! Spoilers ahead now. It’s okay if you have to leave. Shuri, King T’Challa’s sister, was one of my favorite parts of Black Panther. Letitia Wright (age 24) is brilliant in her role. Shuri is the best kind of little sister, as well as being a clever and intelligent movie on her own. Her intelligence and affection for her brother are at the forefront of her character, while her humor is pure and absolutely hilarious. She is gorgeous and fierce. She is a role model to women my age because she uses her talents with confidence, while still wanting to always improve. Her heart is even bigger than her mind. Honestly, the girl could be an evil genius if she wanted to, but she is pure-hearted in the best way. I hope we get to see more of Shuri in the upcoming Marvel movies (more Black Panther movies, PLEASE), and more of Letitia in other movies. She’s wonderful. Is a POWER HOUSE of a woman. She is kind and lovely and beautiful, but she also isn’t putting up with anyone’s (T’Challa’s) crap. Her first priority is her people and puts their welfare before her own life. She is her own person, which is why T’challa loves her. The love story between Nakia and T’challa is beautiful, because they make each other want to be better and they encourage the other to do what is best for them. I’m excited to see their relationship grow as they come into themselves and their roles as leaders of Wakanda. *unintelligible screaming* Danai Gurira is a gift to us all. Okoye’s no-nonsense attitude mixed with her loyalty to Wakanda (and to the rightful heir to the throne…), even against her own husband, is a testament to her womanhood and her strength. I am in awe of her. There are so many parts of her character I could write about, but perhaps my favorite is her inner kindness and softness. When she steps in front of the war rhino her husband is riding in on, it shows that she is fearless, but also shows the affect her nurturing side has on the animal when it licks her. The rhino knew its mommy and stopped in a moment of extreme pressure to give love to its caretaker. And Okoye welcomes the affection, before turning to the source of the conflict: her husband (Who, I might add, yields when he realizes that he could lose much more than his life in the battle–the love of his life). Oh, my. Here I am again, with so many emotions and not nearly enough words to express them! 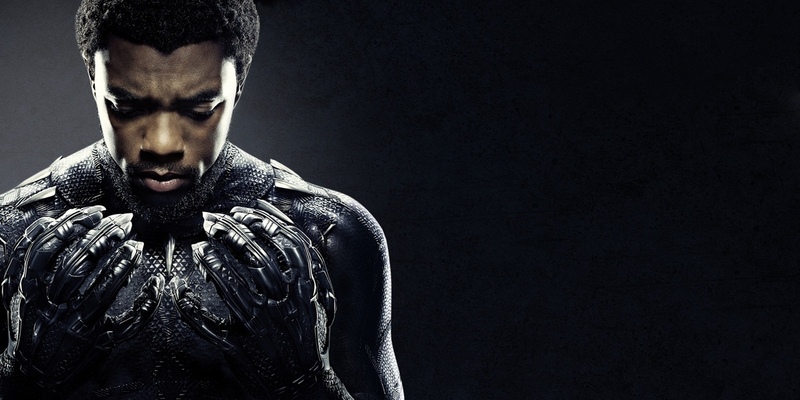 T’Challa is a hero for more reasons than just his superhuman abilities. He actually cares. The growth we see in him from Captain America: Civil War to Black Panther is incredible. No longer was he the young man burdened by avenging his father’s death, but a man who recognized the responsibility of a king. He did not want the throne for glory, but for his people. He didn’t fight to stay alive, he fought for Wakanda. One step further from his loyalty to his people is his pure love for humanity. He had no reason to try to save Killmonger, other than the simple reason that T’Challa believed he could have good in his heart. That’s why he took Killmonger to see the sunrise (sunset?). It’s why he mourned when Killmonger took his last breath. T’Challa cares because it’s who he is, not because it’s his duty. That’s what will make him a great king, and a greater example to others. Plus, he’s totally human and goofy. He’s the best big brother to Shuri by having fun with her, protecting her, and allowing her to grow and become her own woman. He’s nervous and awkward around Nakia, because she is breathtaking to him–in more ways than just outer beauty. And he cares about the people who serve him. They aren’t his servants, but his allies and friends. I think Marvel would do well to have more movies like Black Panther. If they keep giving us masterpieces like this, they’ll continue having success. I loved Black Panther. It was absolutely incredible and I can’t wait to see where the next story leads us. I’m excited to watch it over and over again when it comes out on DVD. If you haven’t seen it, GO SEE IT. It’s worth it. ANDY FREAKING SERKIS. What can’t that man do?